Home Fashion Ethnic Fashion Different saree draping styles for weddings, Receptions and party! Different saree draping styles for weddings, Receptions and party! 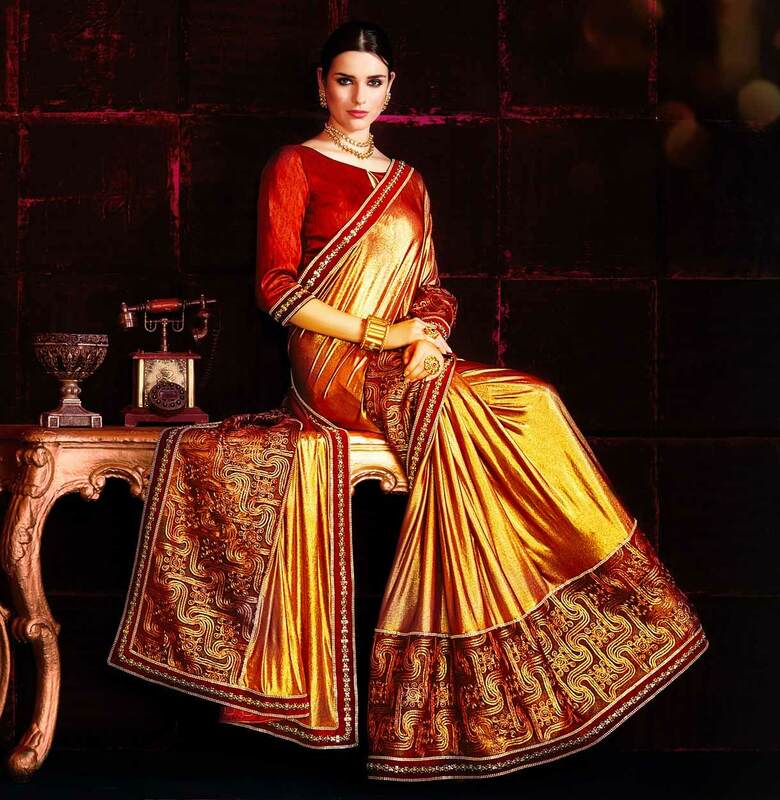 Are You searching for some different saree draping styles for the next party you are heading to? Decades have passed but Saree is still the Indian women’s most favored dressing garment for any special occasion. Indian or not we would all agree how 9-yard long look unquestionably charismatic and exudes out the feminine grace and beauty like no other. We have grown up hearing “India is a land of diversity” and it has certainly impacted the Saree draping styles. Besides some conventional styles, designers and celebrities also keep inspiring up with their innovative and wowing looks with Saree. Saree is no longer just to be worn at the wedding or formal events. It can take your personal style quotient up the notch especially by experimenting with your different styles of draping a saree. In today’s blog, we are going to talk about some of the incredible draping styles, regional as well as the designer, you might start reconsidering this attire if you haven’t worn this for a long time. Let’s explore these styles and trust us, some of them would be totally new to you, there is something for everyone pleasing your mood, taste and your inner diva. We cannot start the journey without mentioning this saree draping style first. It’s a most common in north India, commonly known as the ‘ulta pallu’ and said to be originating from Andhra Pradesh. It’s is quite easy and basic method, where you gather one end to make pleats and secure it with or brooch. Jacket always add some regal feel with whichever dress you pair it with. Try the jacket with your Saree, you can keep the ‘pallu’ either inside the jacket or tuck it outside, this contemporary style knows no bound. You can have velvet, silk, embellished and even formal black fitting coat to make your saree grand, also play with the different collar patterns. We think this is a serious and very intelligent way of adding glamorous streak to your any saree. These belts are a modern version of the Indian waistband ‘kamar band’ and but today you can choose belt made out fabric or any leather or metal band. And why did we say intelligent? Did you notice how broad golden metal waistband is defining the waist and an instant inch loss! Well, all joking aside, add this fun element if you are bored and don’t wanna do much. This is an off beat saree draping style for weddings. Gujarati draping style of sarees are from the lands of Gujarat. Its one of the traditional graceful draping styles. If you want to make it more trendy and modish try latest modern blouse designs or you can add belt just how our fashion icon Sonam Kapoor pulled this draping style by adding the belt, simple and yet very captivating! This is a retro style but still one of the most endeared and worn saree draping styles to look slim in the present times. This sleek and snazzy draping pattern looks quite similar to the ‘Nivi style’ with the difference between very thin pleats allowing peeping belly button and midriff. Wear this style if you love looking fuming hot with the dash of traditional feel. You can totally pull this saree draping style even if you are not a Bengali bala. Try this exotic saree draping style for reception with the silk and cotton sarees with rich borders. Make box pleats around the waist instead of the regular one then make the pallu pleats on the right shoulder, tuck it and then cross it over the left shoulder and bring forward the one corner of the pallu and secure it. To drape this saree style, the saree needs to be 8 meters long. These types of saree draping styles were quite functional and comfortable for the women in the old times and still worn by the Marathi women. In this one side is tucked behind the back at center and the other side is draped as the regular pleated pallu. This draping style got its name from veteran actress Mumtaz and it got extremely famous since she graced this style in a song from an old movie. This draping style makes a woman look extremely curvy and elegantly sassy. Priyanka Chopra, Deepika Padukone has also been flaunting this style and looked absolutely gorgeous. Soft and flowy fabric like chiffon and georgette with a border is appropriate for this styling pattern. This saree draping style belongs to Karnataka and is a unique and beautiful method. In this regional saree wearing style, pleats are made around the waist at the back and the other end or pallu is taken at front. Needless to say that either you have worn this style or must have seen it other women ornating it. It’s very common, yet very loved and popular by the ladies. In a moment of doubt or you’re running out of time, just leave the pallu open and you are all set. The other good thing about of this drape is that it shows the work and embellishment done on the pallu which hides away in some drape. This is a trendiest and bold diva saree draping style that we really recommend every girl or a lady to try their hands on. These type of Saree draping styles are getting popularity when Sonam Kapoor appeared in this style. This is one of the most creative and dainty looking styles that you can try and ditch the old saree draping style. This requires two sarees either matching or complimenting. Lehenga saree is the best Saree draping style for weddings of 2018. This draping style actually saves us from spending money on buying a Lehenga. Soft fabric sarees are best for this drape. All you need to make flare is to spread your pleats across the waist and then tuck the other end in a regular way. This is simple yet makes a huge difference to the regular saree look. How cool and sassy this look is just by wrapping the end around your neck. This is again effortless chic look, who doesn’t want to just boring and common. To amp up the whole look, accessorize it with statement clutch and jewelry. Let us know how do you find these saree draping styles. Hope you got inspired and got what you were looking for to stand out and just feel magical because that is what a saree ought to do! Aarti Pathak is a fashion enthusiast and the media manager at Vasansi, Jaipur. Vasansi is a premium designer ethnic wear brand of India which is renowned worldwide for its bridal couture, Anarkali suits, and Indo western dresses.